As you will find out, I’m a big child. I have zero shame in the shows I watch, the books I read or the video games I play. If it interests me, then so be it. 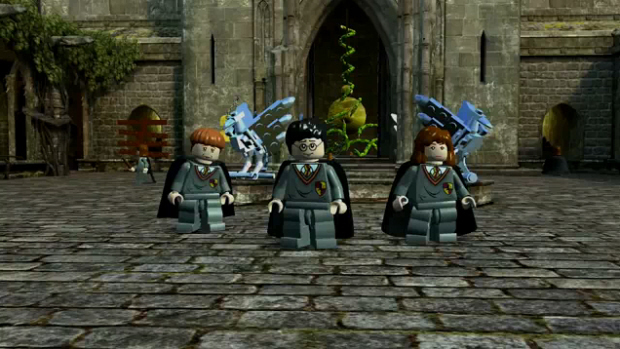 So when I decided I wanted to play some Lego Harry Potter on my Wii, I did just that. Never having played a Lego video game before, I didn’t really know what to expect. I drove over to my local game store and bought me a used copy and went straight home to play. Let me just preface this by saying that there is no way this game is for kids. Either that or I can be incredibly dumb during certain points of this game. I can’t believe how hard some of the tasks are! But I do have to say I love the way they tell the story. Some of the developers seriously have a sense of humor. We’ll just say it’s not exactly to book or movie, but pretty close. I will also have to admit that I may have gone online for a few level walkthrough hints. And I’m convinced that my game hated me at certain points. But as I read comments I learned that it hated everyone at those same points. So then I didn’t feel as bad. You play as Harry Potter most of the time, but as you have two others with you at all times, you are able to switch between characters, as there are challenges within the levels that require other character’s abilities rather than Harry’s. During the game you have levels to complete of course. And within those levels are the opportunities to learn new spells, collect gold bricks and red boxes which you can use in Hogsmead. You find that the Wingardium Leviosa spell is the most commonly used, and when I finally got to the Expecto Patronum spell in year three I fell in love with it. I love killing those dementors! You also get to have fun destroying near everything in sight to collect lego coins which can be used to purchase items in Hogsmead. There are bonus levels you access with your gold bricks at Gringotts, which in turn earn you more coins. With the Wii you do have to play the game using the controller and nunchuk, but you get used to it. Not being a huge gamer, I’m not going to comment on graphics and all of the technical aspects of the game. I will just say that after you’ve played it for a couple hours you will be humming the music for the rest of the day, and may even hear it in your sleep and then wake up with it still in your head. Ok that may have just been me. This game isn’t just for kids like you would assume. It’s actually a lot of fun to play, but then again I’m just a big kid. I thoroughly enjoyed this game, and am now playing years 5-7 which I will write about once I’ve completed the game. Game Downfalls: There were a couple glitches on the game and you have to do a round about way to get it to work, but it was only in a couple spots, so once you got past them, you weren’t bothered anymore. The biggest issue I had was that when you’re playing one player, you always have two people with you following your every move. The majority of the time it’s Hermione and Ron, but on occasion they would switch it up and give you other characters. The following your every move would hinder your abilities at times, as they were in the way of what you were trying to do. For me that drove me crazy and I would rather play two player just to help alleviate that nuisance and only have one person following your every move. This entry was posted in Video Games and tagged Harry Potter, Lego, Video Games by foreveracouchpotato. Bookmark the permalink.